when you travel in Tibet, you may need to buy some stuffs in Lhasa supermarkets. Here are 4 main supermarkets in Lhasa city. They sell different kinds of products that meet travelers’ needs. Moreover, they are Lhasa Baiyi supermarket, Hongyan supermarket, Sifang supermarket and Norling supermarket. Besides, they also located in downtown Lhasa, and you can easily find one in Lhasa streets. Meanwhile, you can buy almost everything in these supermarkets just as other inner cities of China. Moreover, you can not only purchase common goods in the 4 supermarkets, but also buy some Tibetan-style products in these shops. 4 main Lhasa Supermarkets Lhasa Supermarkets-Some people may have trouble to buy their necessary stuffs in Lhasa city, because they can’t find big supermarkets in Lhasa. And here is good news for travelers! I have listed several big supermarkets that are well distributed in the city. Furthermore, along with the development of Tibet, you can buy almost everything you need in Lhasa just as in any other big cities of China. 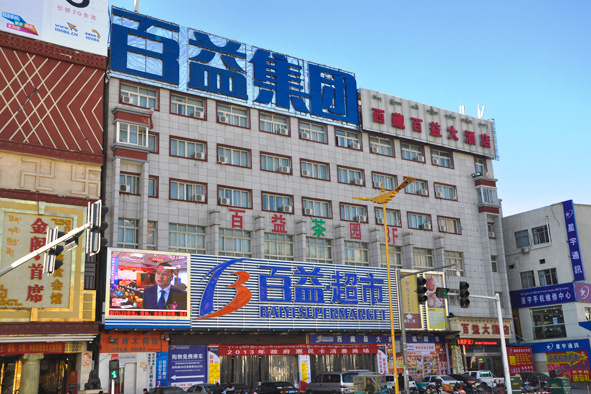 Lhasa Baiyi supermarket As one famous supermarket in downtown Lhasa, Baiyi supermarket, offers wide range of imported goods and Tibetan specialties. Therefore, you can purchase not only common goods of daily life, but also Tibetan-style food and goods. What's more, it is next to Lhasa Department Store, boasts Lhasa’s best range of foodstuffs. Location: Xijiao Branch (West suburb of Lhasa Branch), 46 Beijing Zhonglu, Lhasa (Moreover, there are many Baiyi supermarkets in Lhasa city. This is only one of them.) Tel: 0891-6881284 Lhasa Hongyan Supermarkets Just like other cities in China, Lhasa also has Hongyan supermarkets in town. There are three main Hongyan supermarkets in Lhasa city as below. Location 1: Mid-section of Beijing Zhonglu, Lhasa Tel: 0891-6320018 Location 2: Xuexin Village, Lhasa Tel: 0891-6820516 Location 3: Jiangsu Lu, Lhasa Tel: 0891-6360765 Lhasa Sifang Supermarket The Lhasa Sifang supermarket is with good location for it is only about 8 minutes walk to Potala Palace or Jokhang Temple. Meanwhile it is a big supermarket with relatively low price. Lhasa Norling Supermarket There are a few Tibetan-run Nepali supermarkets that sells imported chocolate, Indian spices and peanut butter. Besides, this supermarket is next to Muslim quarter. For further info of Tibet travel tips, please follow our Tibet Travel Blog. You may also learn more info in our homepage.